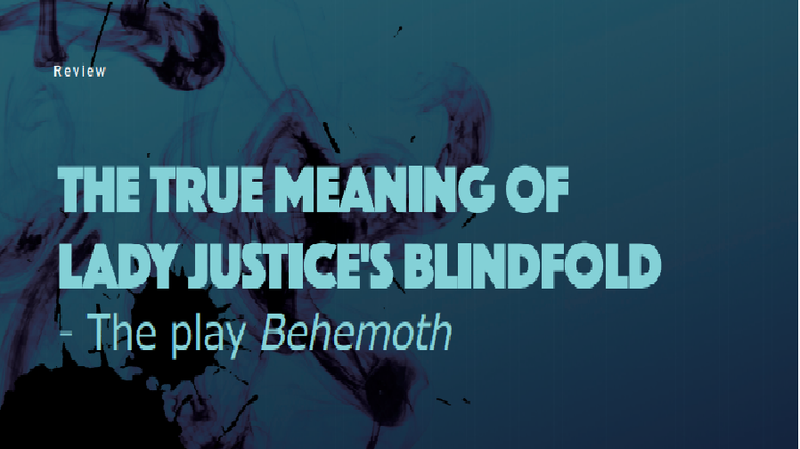 The True Meaning of Lady Justice's BlindfoldThe Play "Behemoth"
In modern society, we often hear news about corrupted public officials and bribery. Among such news stories, corruption involving public figures in positions of authority and conglomerates is always a controversial issue. Ugly truths surface quite frequently about deals that conglomerates have struck with public authorities to cover up wrongdoings. Sad to say, we found out that even prosecutors and lawyers, who are supposed to uphold justice, are also involved in bribery scandals. In that sense, the term “justice” is gradually losing its true meaning and this causes people to lose faith in their government and public officials. The play Behemoth aims to expose such ugliness and condemn the wrongdoings of public officials and conglomerates in the contemporary society. The first scene opens with the male heir of a conglomerate, Tae-suk, and a female gold digger, Min-ah, in room 1103 of the Royal Hotel. They first met in a nightclub and Min-ah purposely approached Tae-suk for money. However, Min-ah is later found dead, lying in a puddle of blood. Tae-suk confesses to his dad, Chang-hoon, over the phone, that he might have killed someone. Changhoon, who highly values his son and his own reputation, is left with a dilemma. The event took place right about the time he was planning to take up a political position, so Chang-hoon’s reputation is at stake. Chang-hoon then calls his lawyer, Lee, and instructs him to help Tae-suk solve the problem. Chang-hoon offers Lee 1 billion won in compensation. The lawyer, who is greedy and values money above all else, accepts the deal and hatches the perfect plan to prove Taesuk’s innocence. He tells Tae-suk what he should reveal during the investigation. From then on, Tae-suk’s weak mind falls prey to a mental disease, and he follows the directions of the lawyer without much resistance. As the second scene begins, a new character, prosecutor Oh appears, holding a model of Lady Justice. The statue of Lady Justice wears a blindfold to signify justice: a fair judgment is only possible when her eyes are covered because with closed eyes all people appear equal. Prosecutor Oh is in charge of prosecuting Min-ah’s death. In the past, prosector Oh had lost his sister and was hindered by the authorities from investigating the incident. Because of that experience, he wants to reveal the truth of Min-ah’s death and punish all the powers behind that death. Although people around Oh seem to avoid taking charge of this issue, Oh continues investigating this incident more passionately because he strongly believes that justice should be done. Prosecutor Oh is convinced of two things: first, that Tae-suk killed Minah, and second, that Chang-hoon tried to cover up his son’s crime with money. Oh starts to interrogate Tae-suk with spot pictures, crucial evidence, and Tae-suk’s original testimony that just did not match up. He believes every piece of evidence is pointing to Taesuk as the murderer and tries his best to reveal Tae-suk’s crime. In the process, he does not care about pressure from his superior to smoothly cover over this incident. Oh continues investigating Taesuk, while Tae-suk continuously responds with the same answers: “I can’t remember.”, “I didn’t kill Minah,” and “At first I thought I killed her, but now I think I am not the murderer,” just as his lawyer directed him to say. The investigation continues, but starts to run into a lot of dead ends. Realizing that there is no way to find out what really happened, prosecutor Oh makes the weighty decision to prove that Taesuk is guilty, and that decision delivers an important message to the audience. Towards the end of the play, the audience is shocked at how the play turns out. Many people may have seen the Scripture of Lady Justice holding a set of scales and a sword. Lady Justice is holding a sword as a representation of the power and strength of justice, and a scale that represents the balance and fairness of Justice. However, since the 15th century, Lady Justice has often been depicted wearing a blindfold. The blindfold symbolizes that the law should be viewed objectively with the determination of innocence or guilt made without bias or prejudice. However, many people might have already noticed, the statue of Lady Justice in front of the Supreme Court of South Korea doesn’t wear blindfold. The play Behemoth sends a strong and clear message about how corrupted our society is. It also provides the audience with an opportunity to rethink the real significance of the blindfold and criticizes the fact that people who deal with laws are distorting the true meaning of it. Many different types of movies, plays, and musicals that aim to portray the political realities of modern society and satirize the current corrupted state of affairs, are being produced. However, all those movies, plays, and musicals tend to gloss over the real violence behind the ugly facts. Nevertheless, Behemoth exposes the problems in our society and points out the corruption among those in positions of authority. The straightforward language used in the play emphasizes the severity of the bribery and corruption rampant today.